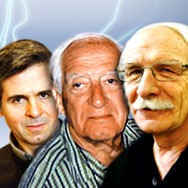 The neuroscientists Joseph Altman, Arturo Álvarez-Buylla and Giacomo Rizzolatti have been bestowed with the 2011 Prince of Asturias Award for Technical and Scientific Research. The Jury for the Award announced its decision today in Oviedo. These three scientists are considered worldwide leaders in neurology for having provided solid proof of the regeneration of neurons in adult brains (neurogenesis) and for the discovery of what are known as mirror neurons. Their research has opened up promising pathways to a new generation of treatments to fight neurodegenerative and brain-related disorders such as Alzheimer’s disease, Parkinson’s disease or Autism. This candidature was proposed by a member of the Prince of Asturias Award Jury and was seconded, among others, by Ricardo Miledi, 1999 Prince of Asturias Laureate for Technical and Scientific Research, and Paul Greengard, 2000 Nobel Laureate in Physiology or Medicine. Joseph Altman commenced his research work in 1961 at the Massachusetts Institute of Technology (MIT) to then move to the University of Purdue (Indiana) in 1968. As an independent investigator at MIT, he discovered adult neurogenesis. This discovery –made by Altman in the 1960’s– was largely ignored by the scientific community until the veracity of his theory was demonstrated in the 1990’s. Using the technique of 3H-thymidine autoradiography to mark dividing cells, his research work confirmed the existence of neurogenesis in some areas of the postnatal and adult brains of rats, especially in the olfactory bulb and the dentate gyrus. He likewise suggested that these new neurons play a crucial role in the processes of memory and learning. It has been shown in several species that new neurons continue to be generated during the postnatal stage and throughout life, especially in the subventricular zones (SVZ) and the subgranular zone of the dentated gyrus (DG) of the hippocampus. Joseph Altman has published numerous essays and is the author of books such as Atlas of Prenatal Rat Brain Development (1994), Development of the Cerebellar System (1996) and Development of the Human Spinal Cord (2001), among others. Arturo Álvarez-Buylla obtained his degree in Biomedical Research from the National Autonomous University of Mexico in 1983 and a PhD from the Rockefeller University in 1988, where he lectured from 1989 to 2000. He is currently a researcher and Professor of Anatomy and Neurosurgery at the University of California, San Francisco. His main fields of work are the neurogenesis of the adult mammalian brain, the assembly of the brain, brain tumours and their repair, and the ontogeny and phylogeny of behaviour. He discovered that a subpopulation of glial cells function as primary progenitors of new neurons incorporated in the olfactory bulb. Using immunocytochemical methods and optical and electronic microscopy, he discovered the subventricular zone in this system that is the origin of the neurogenesis of adult olfactory cells and the chain migration of these cells towards the olfactory bulb, following a specific pathway named the rostral migratory stream. A corresponding foreign member of the Spanish Royal Academy of Exact, Physical and Natural Sciences, he is also a member of the Society for Neurosciences (USA), the International Brain Research Organization, the Biochemical Society (USA), the Academia de Ciencias de America Latina, the International Society for Stem Cell Research (USA) and the American Society for Cell Biology. The honours and awards he has received include the Gabino Barreda Medal from the National Autonomous University of Mexico (1983), the Robert L. Sinsheimer Award (USA, 1992), the Jacob Javits Award (USA, 2000), the IPSEN Foundation Prize (France, 2002) and the Association for Chemoreception Sciences Award (USA, 2004). Giacomo Rizzolatti (Kiev, 1937) obtained his degree in Medicine and Surgery from the University of Padua, specialising in Neurology. He subsequently spent three years at the University of Pisa Institute of Physiology, directed at that time by Professor Giuseppe Moruzzi. His academic career continued at the University of Parma, where is currently Professor of Physiology in the Department of Neurosciences at the Faculty of Medicine and Surgery. Since the early 1990’s, he has collaborated closely with the Department of Computer Science and Neuroscience at the University of Southern California, Los Angeles and with the Ahmanson Lovelace Brain Mapping Centre at the University of California, Los Angeles (UCLA). The focus of his early research work lay in the fields of the physiology of dreaming and sight. In particular, he studied the functional organisation of the superior colliculus and of the corpus callosum of the brain. He subsequently studied the motor system and its role in perception, as well as attention and the relations between attention and the motor system. While studying the relation between the motor system and cognitive functions in the early 1990’s, Rizzolatti discovered a type of neuron in monkey brains that was activated not only when the individual performed a particular action, but also when an individual observed a peer carrying out the same action. Called mirror neurons, this finding led a revolution in our understanding of the way in which individuals interact with others. Subsequent research showed the role of these neurons in human beings and their diverse implications in sensory capacities and in the development of language and communication. Mirror neurons enable imitation and empathy to be explained. Likewise, a deficit of mirror neurons may be responsible for several important symptoms of autism: social, motor and language-related problems. These neurons provide a suitable framework for the understanding of the mechanisms underlying emotional empathy, imitation, communication and social behaviour. Holder of honorary doctorates from the Claude Bernard University of Lyon, the University of St. Petersburg and the Catholic University of Louvain, he has been the president of the European Brain and Behaviour Society and the Italian Society of Neuroscience. For several years, he headed the European Training Programme in Brain and Behaviour Research. He is a member of the Academia Europaea, of the Accademia dei Lincei and an honorary foreign member of the American Academy of Arts and Sciences. Among other honours and awards, he has received the George Miller Award from the Cognitive Neuroscience Society (USA, 1999), the Feltrinelli Prize for Medicine (Italy, 2000), the Grawemeyer Prize for Psychology (USA, 2007) and the IPSEN Foundation Prize in Neuroplasticity (France, 2007). According to the Statutes of the Foundation, the Prince of Asturias Awards aim “to reward the scientific, technical, cultural, social and humanistic work performed at an international level by individuals, institutions or groups of individuals or institutions”. As part of this spirit those "whose findings or research work represent a relevant contribution to the progress of mankind in the fields of Mathematics, Physics, Chemistry, Biology, Medicine or Environmental, Earth or Space Sciences, or to their associated techniques and technology" may be nominated for the Prince of Asturias Award for Technical and Scientific Research. This year a total of 41 candidatures from Argentina, Australia, Belgium, Brazil, Canada, Czech Republic, Chile, France, Germany, Greece, Italy, Japan, Mexico, Netherlands, Sweden, Switzerland, Ukraine, United Kingdom, United States and Spain ran for the award. This is the fourth of eight Prince of Asturias Awards to be bestowed this year for the thirty first time. The Prince of Asturias Award for the Arts went to Italian conductor Riccardo Muti, the Prince of Asturias Award for Social Sciences was given to US psychologist Howard Gardner and the Prince of Asturias Award for Communication and Humanities went to British institution The Royal Society. The rest of awards will be announced in the coming weeks in the following order: Letters and International Cooperation, with the Sports and Concord awards being announced in September.